Tag line: "You'll believe it when you see it!" Three wannabe filmmakers: Thomas (Glenn Erland Tosterud), Johanna (Johanna Mørck), and Kalle (Tomas Alf Larsen), are hot on the trail of a suspected bear poacher named Hans (Otto Jespersen). But when they follow him into the woods one evening hoping to catch him in the act, the trio discovers that Hans is actually searching for a creature much bigger, and more unpredictable, than any bear. As it turns out, Hans works for the TSS, or Troll Security Service, a branch of the government tasked with keeping Norway’s huge troll population under control. Though skeptical at first, Thomas and the others soon realize that trolls do, indeed, exist, and despite the secrecy his job demands, Hans permits the three to ride along with him, exposing them to the occasionally exciting, often dangerous world of troll hunting. Released in 2010, director André Øvredal’s Troll Hunter is another entry in the found footage sub-genre, yet aside from the occasional “shaky cam”, the movie makes good use of its documentary-like approach, bringing a feeling of authenticity to what is otherwise a fantastically unbelievable tale. Part of the credit for the film's success has to go to the three young actors playing the film crew, all of whom do a fine job, but the best performance is by Otto Jespersen as Hans, who delivers his lines with such a quiet confidence that we believe every word, no matter how outlandish they may seem (at one point, he asks his new friends if any of them are Christians, because, apparently, trolls can smell Christian blood from a mile away). 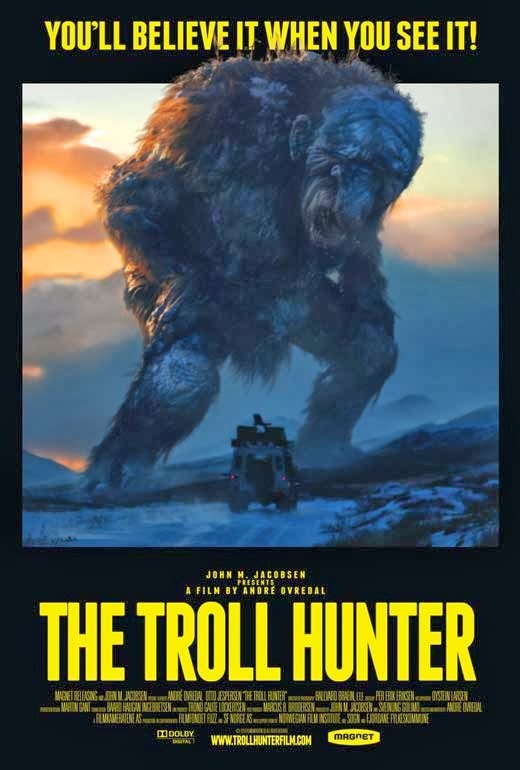 Along with the performances, Troll Hunter features some outstanding effects, which bring the various trolls to life in a surprisingly realistic way. The first troll Thomas and the others encounter is an enormous beast with 3 heads, standing some 30 feet high and knocking down trees as it chases the group through the woods. Initially, we catch only brief glimpses of this troll, mostly because Kalle, the cameraman, is scared out of his wits, and running for his life. But when he stops and switches the camera to night vision, we finally see the creature in all its glory (the scene ends with another spectacular effect, showing us what happens when a troll is exposed to bright light). Even if you’ve grown weary of the whole found footage craze, I’d recommend giving Troll Hunter a try. A wildly imaginative film that’s also a hell of a lot of fun, Troll Hunter is an absolute treat. I agree with your analysis: The film has "a feeling of authenticity to what is otherwise a fantastically unbelievable tale."